I’ve openly admitted my fascination with a style of furniture that has a plethora of names – Arts and Crafts, Mission, Prairie, Craftsman, Stickley or Greene & Greene. Ironically while I’m drawn to it’s beautiful lines and it’s emphasis on material and craftsmanship over ornamentation and extravagance, I have yet to truly build much that resembles it. 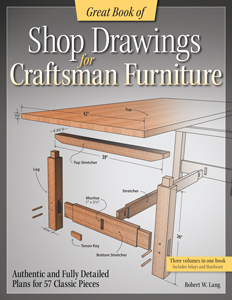 With the release of Bob Lang’s latest and greatest title “Great Book of Shop Drawings for Craftsman Furniture” my only excuse for not finally building an amazing piece of furniture from this style is laziness, pure and simple! “Great Book of Shop Drawings for Craftsman Furniture” is a compilation of Bob’s first, second and fourth books, “Shop Drawings for Craftsman Furniture”, “More Shop Drawings for Craftsman Furniture” and “Shop Drawings for Craftsman Inlays & Hardware”. This new compilation contains detailed drawings and cutlists for 57 authentic pieces along with drawings for Harvey Ellis inlays, and Stickley hand-hammered copper hardware. It’s also complete with introductory text from the original books has been updated to include numerous new photos of both original Stickley pieces and the author building reproductions for demonstration. In honor of the release of “Great Book of Shop Drawings for Craftsman Furniture” Bob is offering Free Media Mail Shipping or Half-Price Priority Mail Shipping Through Labor Day, 2012 (US addresses only). Signed copies are also available, but hurry before these sell out! I have a feeling this title is going to become a huge hit real fast. Visit Bob’s website to order today at www.readwatchdo.com.